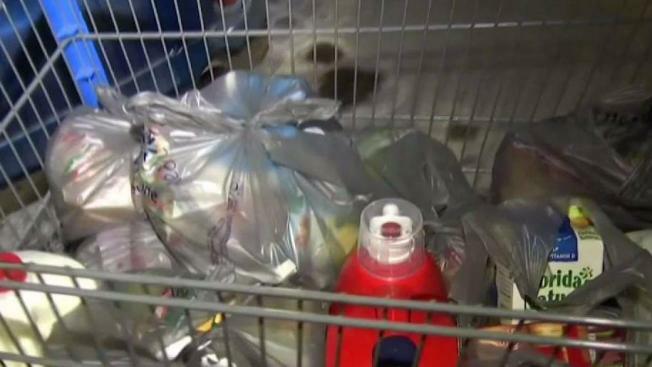 Shoppers packed stores as crews got ready for potential power outages with more than a foot of snow expected in much of New England. Massachusetts officials are warning of damaging winds, whiteout conditions, power outages and possible coastal flooding from an approaching snowstorm. Gov. Charlie Baker said state government will be closed Thursday for non-emergency workers, and he's asking private employers to allow their employees to work from home if possible. He urged residents Wednesday to stay at home during the storm or use public transportation. The National Weather Service has issued a blizzard warning for Thursday that includes Boston and extends from Block Island, Rhode Island, all the way north to coastal New Hampshire and Maine. Most of the rest of southern New England is under a winter storm watch. The storm is expected to bring a foot of snow for some. Delta airlines proactively canceled more than 400 flights at New York's LaGuardia and JFK airports, and Boston Logan airport. Air travellers are urged to check the Logan Airport website for information on flight statuses. Preparations are underway across the state ahead of Thursday's winter storm. Boston Public Schools will be closed on Thursday, Mayor Marty Walsh announced Wednesday. More than 200 other schools in Massachusetts and New Hampshire had already announced closures as of Wednesday night. Walsh urged residents to be patient as crews work to treat the roads and plow streets. "We're asking people to stay off the roads to get the plows out there," he said. "Keep the kids in the house... plows can't stop on a dime in a lot of cases." City officials said one major concern is the freezing temperatures that will persist beyond Thursday's storm. "Whatever snow is missed tomorrow because the plows couldn't get to them could turn into ice," Walsh said. A parking ban is in effect in Boston starting at 7 a.m. Thursday. Parking space savers will be removed from the street, Walsh said. 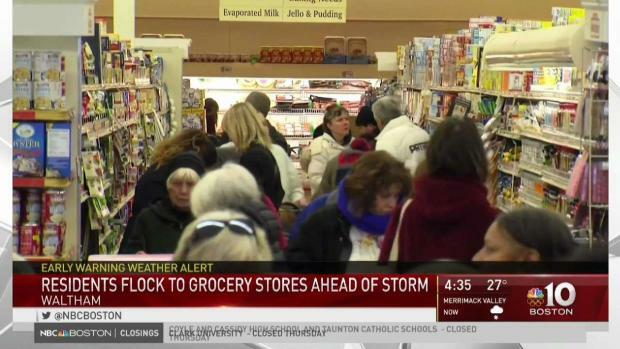 Many are stocking up on groceries in anticipation of Thursday's large storm. City outreach teams will be out during the storm encouraging people to seek shelter indoors. "Boston is no stranger to big storms, and the best way to get through them is to help each other out," Walsh said. "We're asking people to be careful, be safe, and be warm." City residents are directed to call 311 or visit the city's website to report storm-related non-emergency issues or to inquire about information such as alternative parking spots. 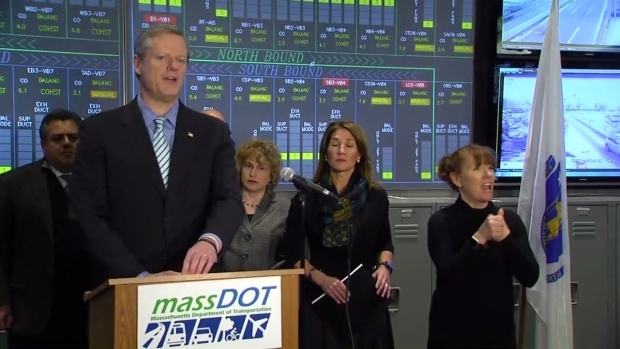 More than 700 Massachusetts Department of Transportation workers are expected to deploy across the state to prevent buildup on roads, MassDOT Secretary Stephanie Pollock said during Wednesday's news conference. The MBTA hopes to keep buses and subways running on a regular schedule Thursday, but the commuter rail will be operating on a reduced schedule and the MBTA ferry will not operate. Service modifications for the subway and bus routes will be updated on the MBTA website. The New Hampshire House, which opened its 2018 session Wednesday, said it is rescheduling Thursday's meeting for next week. Lawmakers in Rhode Island and Connecticut also canceled or postponed sessions scheduled for Thursday. Governor Charlie Baker discusses Massachusetts's storm preparation, including stationing crews in anticipation of power outages. Officials are asking residents to prepare for possible power outages by fully charging their cell phones, laptops, and other electronic devices, and to consider buying a generator to provide power during an outage. Al Mucci of Uxbridge, Massachusetts, isn't taking chances. He'll be relying on his wood stove in case the power goes out. National Grid and Eversource are urging people to take precautions, suggesting to stock up on non-perishables and charge cell phones. Depending on how bad the winds are, it could take days for utility crews to make it to trouble spots and restore power. "We're expecting wet, heavy snow," said National Guard spokesperson Christine Milligan. "We're expecting hurricane force winds, so thta is a recipe for outages." Residents should also remove dead or rotting trees around their homes that could fall during high wind gusts, ensure that smoke and carbon monoxide detectors are working, make sure their homes are properly insulated and check heating fuel supplies. 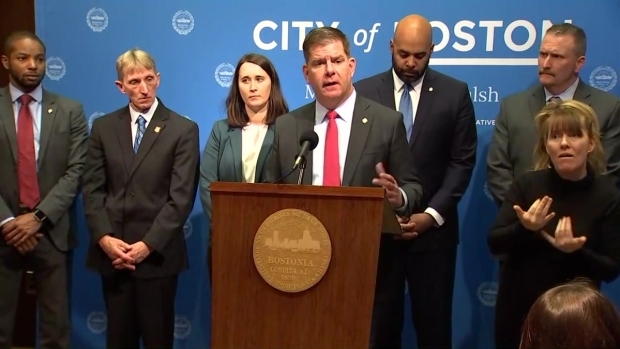 Boston Mayor Marty Walsh has a news conference to discuss the city's storm preparations, including school closings, transportation, and snow removal. 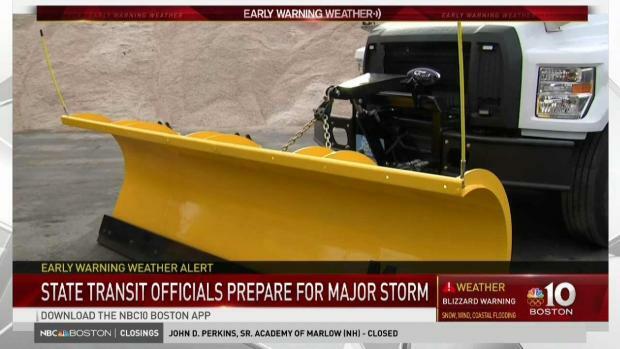 Massachusetts officials are saying that if you do have to go out on the roads, make sure you have at least a half a tank of gas and have a winter emergency car kit in the trunk. Click here for MEMA's supply check-list and click here for winter driving safety tips. In addition to blizzard warnings, coastal flood, high wind, winter storm and wind chill warnings have been issued around the region. Click here for our full list of active severe weather alerts. Frigid temperatures are forecast to return Friday, with possibly life-threatening wind chills values.